His level is 109 like the most minis in PoHate. Max hit on a group geared (TBM/TDS) tank with only 12k AC and 166k HP buffed was about 26k. This mob seems quite overpowered for a group with only group gear (TBM/TDS). To cope with Festering Sores might be possible, to cope with his everlasting mending-series makes this fight really numb. Perhaps there is a link between the DoT and the mending, so that mending starts, when the DoT is not cured in a minimum of time. But to have a strat which works with non-ubah groups would help greatly. If somebody has done him, please post the group combination and the strat. The only one so far seems pure zerging with DPS to burn him down in less than 20s. This mob seems quite overpowered for a group with only group gear (TBM/TDS). To cope with Festering Sores might be possible, to cope with his everlasting mending-series makes this fight really numb. Perhaps there is a link between the DoT and the mending, so that mending starts, when the DoT is not cured in a minimum of time. But to have a strat which works with non-ubah groups would help greatly. If somebody has done him, please post the group combination and the strat. Updated the Mistress of Scorn entry, thanks! 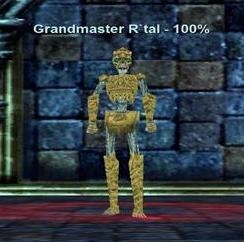 Note: post is technically in the wrong place, but was in response to some now-nuked prior posts that were in this thread about Grandmaster R'tal --for those looking at this years from now wondering.